On Valentine’s Day, our thoughts inevitably turn to the birds and the bees. And as someone who studies birds, I can tell you our feathered friends have much to teach us about courtship and sanity. Take hummingbirds, for example: If you know anything about them, you might think it would be a pretty cool existence. Hummingbirds are the only birds in the world that can fly backward. They’re the fighter jets of the bird world. But have you ever watched hummingbirds fight with each other? They’re vicious. At my home in Oregon, my backyard is visited by Rufous hummingbirds during the summer, and I have to put out three different feeders so that three different male hummers can stake out territory around the yard. They won’t tolerate each other at all, and, if one trespasses on the other’s territory, they’ll immediately get buzzed. It’s ridiculous, because the feeders have an unlimited supply of sugar water. Why are hummingbirds so mean? Only the greediest survive. Hummingbirds are so small that they lose a lot of heat. Their surface area-to-volume ratio is very high (which is why small ice cubes melt faster than big ones). If they were any smaller, they couldn’t physically eat enough to stay warm. Sharing your food might mean the difference between life and death. And if they slow down even for one minute, they risk running out of calories. Because they have to be so greedy all the time, hummingbirds never stop bickering and fighting with each other. Males and females can’t even get along enough to raise their children together. Mating takes about a second, then the female retreats to build a nest and raise the chicks all on her own. Does this sound like a life you’d want to have? The trouble is, we humans are speeding up, too. In recent years, the speed with which people walk on the sidewalks of the world’s major cities has increased dramatically—according to one 2007 study, from 2.97 mph to 3.27 mph in a decade. Instant gratification is becoming ever-more-instant for us today—and we seem to be in a rush to get wherever we’re going. So-called divorce rates in albatrosses have been measured at near zero percent. If I were given the choice to become any bird in the world, I’d be an albatross. Just imagine having all the time in the world to put out your wings and glide indefinitely. Albatrosses are the opposite of hummingbirds: Where hummingbirds have the highest cost of flight of any bird, albatrosses have the lowest. Scientists have tried to measure how much energy it takes for an albatross to stay in the air and they’ve come up with … zero energy. There are various reasons for this but when an albatross is gliding on the wind, it actually has a lower resting heart rate than when it is sitting on the water. So they stay in the air, and fly, and keep flying. Some people think albatrosses may live this way to a hundred years old—we just haven’t studied them that long yet. By the most conservative estimate, the average wandering albatross will fly several million miles in its lifetime—from the Earth to the moon and back eight or 10 times. And, for most of that time, they will be alone. With all this time alone, you might think that albatrosses, like hummingbirds, have sacrificed something in their love lives, but nothing could be further from the truth. I’ve seen nesting albatrosses in a couple of places. When I visited black-browed albatrosses in the Falkland Islands, off the tip of South America, it was a moving experience. Up close, these birds are huge, and they just feel, well, incredibly calm and collected, completely the opposite of a hummingbird. Albatrosses are never in a hurry. They truly do mate for life: So-called divorce rates in albatrosses have been measured at near zero percent. Pairs stay together until one of them dies—they’re the most committed lovers of any bird. Human divorce rates around the world hover near 40 percent, which puts us on about the same level as a seabird called the Nazca booby. Like us, albatrosses take a long time to pick a partner. When they’re a few years old, they return to their nesting colony and begin to perform elaborate dances with prospective mates, at first in small groups, then, gradually, over the years, with fewer and fewer partners, until each bird dances with only one other, which will become its mate. At that point, they pretty much quit dancing and move on with their lives. It’s humbling to watch a pair of albatrosses in their nest. They snuggle together, preen each other tenderly, and gaze into each other’s eyes, just as you would imagine from a pair of lovebirds. 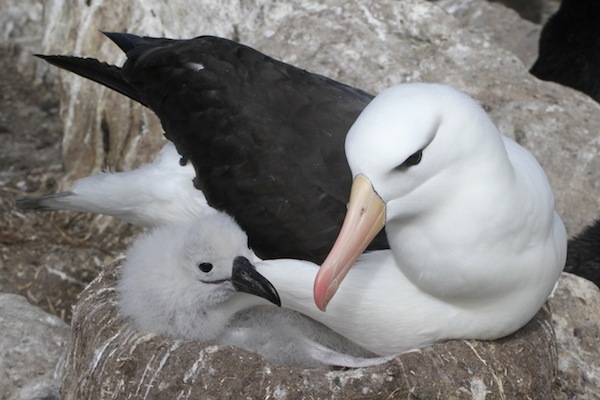 The oldest known albatrosses are still raising chicks with their partners into their 60s. Do these birds actually experience love like we do? Well, I think so. Since love is really just a flood of chemicals released in the brain–technically, you never love someone with all your heart but your ventral tegmental area–there is no reason this feeling should be limited to humans. Love serves a practical purpose: It helps parents and families stick together. The same evolutionary forces that acted on us, and made us fall in love, have also acted on albatrosses, which live a long time, don’t have many children, and put a lot of effort into their offspring. And if this kind of devotion comes with a life of calm and a bird’s eye view of the entire world, what’s not to love? Noah Strycker is the associate editor of Birding magazine, and the author of Among Penguins (2011) and The Thing With Feathers (2014). In 2015, he is on a quest to be the first person to see half the world’s bird species—5,000—in a single calendar year at audubon.org/noah. *Photo courtesy of Noah Strycker.